The lithium in iPhone batteries isn't exactly a scarce resource, but it's not massively abundant and it's very environmentally unsound to stick used batteries in the bin. They're not hard to recycle: just take them along to the local recycling centre or municipal tip and they will happily recycle used batteries for you. Hope this helps. Thanks again for the excellent service. Thank you so much for your help and advice Martin. Why is battery recycling important? As I mentioned above, batteries can’t be thrown with your regular waste because they harm the environment. Batteries contain highly toxic heavy metals including lead, cadmium, nickel and mercury that can easily contaminate the soil, groundwaters, lakes and streams if we bury them. If we incinerate them, the iPhone batteries release heavy metals into air and cause atmospheric pollution. Campaigners have pointed out that it doesn’t make any sense to bury these resources when we’re also busy mining them at expensive environmental cost. How do we do recycle batteries? As soon as your iPhone lithium ion battery is dead, we will help you dispose and recycle it properly, in an environmentally friendly manner. First, we collect them in our office and then we take them to a Mobile recycling centre, where they have a battery collection plan and they are recycled properly. We want to be a greener company, and try to limit our energy usage where possible. We’re striving towards a paperless office, try to use environmentally friendly suppliers and all cycle or use public transport to get to work whenever possible. However, if you have any suggestions on further things we can do, please get in touch. 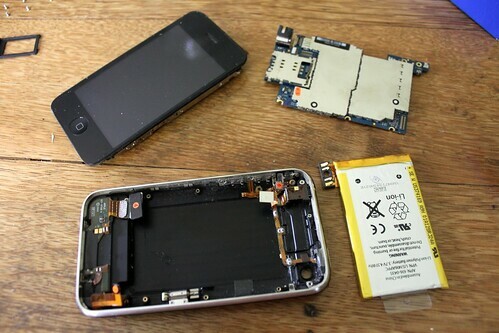 If you want to be eco-friendly and recycle your iPhone battery after you replace it, please get in touch with the Lovefone team and we are more than happy to help!